Have you ever walked into a hotel and thought, ‘Man, this isn’t how I pictured things when I booked the room.’ While you can’t exactly change the layout or furnishings of the room – unless you switch hotels – a new partnership between Marriott and Samsung could let you escape the reality of your humdrum lodgings for a bit. Marriott today announced an initiative to test “VRoom Service” over a two-week period at the New York Marriott Marquis and London Marriott Park Lane hotels. Through the service, Marriott guests can call a dedicated VRoom Service extension and request to checkout a Samsung Gear VR headset and headphones for an “in-room virtual reality experience” for 24 hours. In addition to launching virtual reality room service, Marriott also announced a new virtual travel content platform called VR Postcards. The platform allows users to experience “intimate and immersive travel stories” through the Samsung headsets. “Each story follows a real traveler on a journey to a unique destination; viewers are immersed in the destination and hear the travelers’ personal stories about why travel is important to them,” Marriott says. The first three VR Postcards were shot in the Andes Mountains in Chile, an ice cream shop in Rwanda and in the bustling streets of Beijing. While Postcards will be available to guest using the VR Room Service, it will also be available to the general public via Samsung Milk VR premium video service. Samsung says the new partnership with Marriott is the first for its Gear VR technology. “We’re tremendously excited to be collaborating with an innovative brand like Marriott on creating the future for travelers,” Matt Apfel, Vice President, Strategy and Creative Content at Samsung Media Solutions Center America, said in a statement. This, of course, isn’t Marriott’s first attempt to improve upon its entertainment offerings. Earlier this year, the company announced it would attempt to beef up its entertainment options by testing in-room access to Netflix, Hulu and other streaming services in select locations. 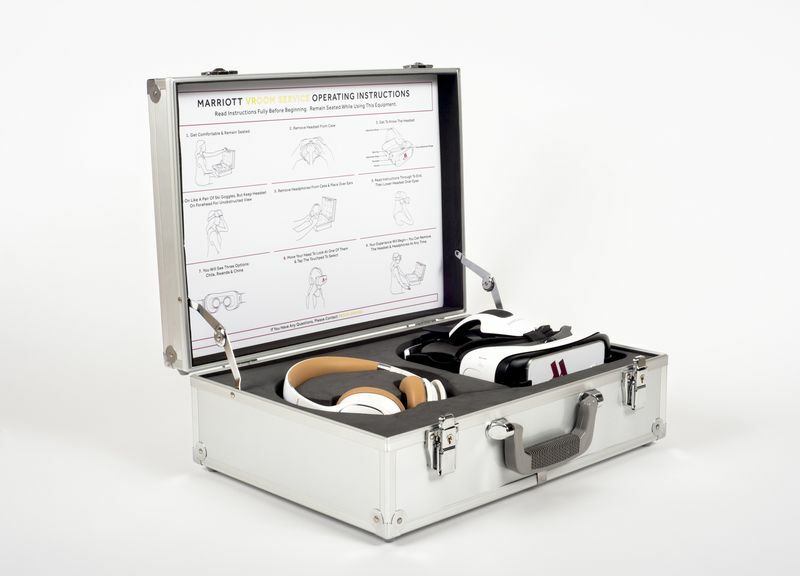 Last year, the company introduced a 4D reality program called The Marriott Transporter. VentureBeat reports that initiative was basically a “teleported” booth featuring the Oculus Rift DK2 VR headset, that took guests on tours of Hawaii and London.